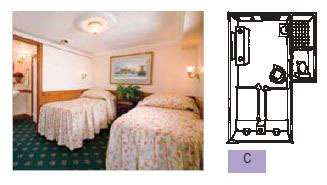 The Delta Queen can accommodate 176 passengers in 88 well-appointed climate controlled staterooms. Each is equipped with private shower and restroom facilities, storage space, and either twin, queen, or king size beds. 120VAC outlets are standard for every cabin. The best of Steamboatin’ accommodations, these richly furnished suites are reminiscent of an earlier day. Each suite offers windows to view America, a sitting area, a queen bed or two single beds, and a private bathroom with tub and shower. Two have an inside entrance from the Betty Blake Library, and two are situated right up front, below the pilothouse. These luxurious accommodations are graciously furnished and reminiscent of times gone by. Each suite offers windows for viewing America, a queen bed, a comfortable chair and desk, and a private bathroom with shower. These outstanding staterooms are distinguished by splendid antique-style furnishings. 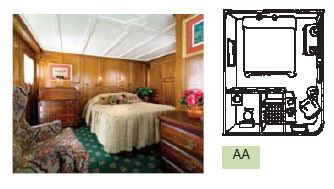 Each stateroom offers an inside entrance from the Betty Blake Library, either two single beds or a queen bed, large windows topped with stained glass, and a private bathroom with shower. Note: Staterooms 117, 118, 121 and 122 have a partially obstructed river view. 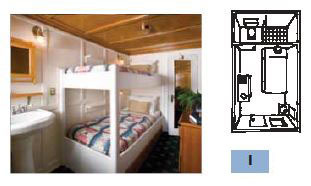 These extra-spacious staterooms feature wood-shuttered windows which frame your view of America. 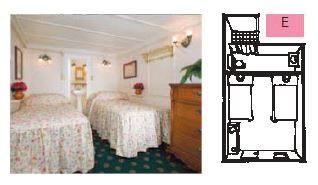 Handsomely furnished, each stateroom offers two single beds and a private bathroom with shower. These spacious staterooms feature an expansive river view through a wood-shuttered window. Each stateroom offers two single beds or a double bed, and a private bathroom with shower. 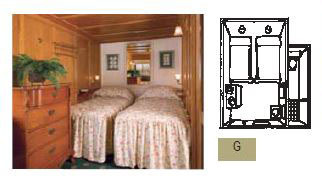 Located on the top deck, these charming staterooms feature an impressive river view framed by a wood-shuttered window. Each stateroom offers two single beds and a private bathroom with shower. 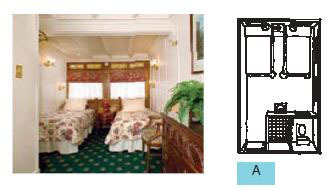 These popular outside staterooms feature a wood-shuttered window from which to view the ever-changing scenery. 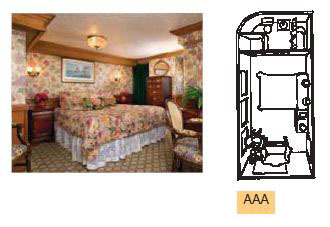 Each stateroom offers an upper and lower berth and a private bathroom with shower.